Scanair India Garlic Dryers in India offered power efficient Heat pump technology Dryers Dealers through Chennai, Bangalore, Hyderabad, Pune, Mumbai, New Delhi, Trivandram, Trichy, Indore, Nagpur, Nashik, Vijayawada, Varanasi, Coimbatore, Tirupur, Sivakasi, Salem,Cochin & Ernakulam, Coimbatore, Pune, Kolkata, Goa, Visakhapatnam Vijayawada, Amravati, Kakinada, Nellore, Guntur, Tirupati, Rajhmundry. Heat pump dryer running cost just as 40% of oil burn dryer, 50% of coal burning boiler, 30% of electric boiler. 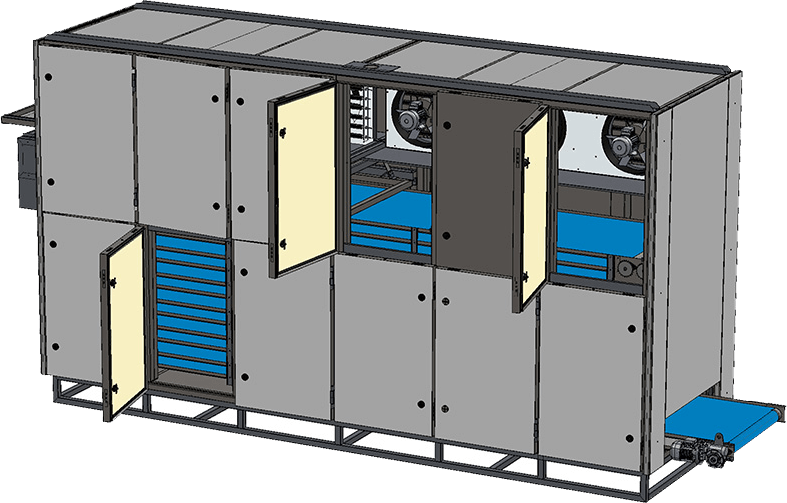 Heat pump dehumidification drying method of the closed cycle, saving costs, no exhaust waste heat emissions, no noise pollution, safe environmental protection. Scanair Garlic Dehydrator heat pump Dryer will maintained air temperature range from 20˚ C To + 80˚ C ˚ ± 5˚ C, capacity from 1Kw to 150Kw From 50 CFM to 20000 CFM air flow capacity. Manufactured using high quality material, manufacturer major types of industrial heat pump Dryers can be adapted for application like Heat pump Tray Dryer, Heat pump Drying Oven, Heat pump hot air blower, Heat pump drying chamber, Heat pump drying room, Drying ware house. This is widely used for heating & drying, Dehumidified drier, Drier, Air drier, Dehumidifying dryers, Rotary dryer, Fluidized bed drier, Vacuum dryer, Industrial dryers, Drying equipment Industrial dehumidification, Air dehumidifier, Industrial heating, Industrial drying, Air dryer, Air drying, Air drying system, Air drying unit, Dry air systems, Dehumidifying, Garlic slices, Wood drying, Fruit drying, vegetable drying, Fish drying, Meat drying, Drying technology, Drying , Seed drying, Moisture drying , Ageing, and many more application. Our range of these products is designed for parallel placement of the material that results in increase in production and saves batch timing by convenient loading and unloading. This types of Tray Dryer is available with external temperature control panel, low and high temperature with superior quality fabricated products, our range of these products is widely demanded in the market. Moreover, these ovens are available in various models are designed & manufacture to suit customer requirements custom-built models also available. are, air source heat pumps, water source heat pumps, geothermal heat pumps, solar heat pumps. ensure the sound application of Garlic Heat pump dryers in Cochin & Ernakulam, Coimbatore, Pune, Kolkata, Goa, Visakhapatnam Vijayawada, Amravati, Kakinada, Nellore, Guntur, Tirupati, Rajhmundry. industries. These heats pump dryers are ozone friendly, packaged type have been designed for many years of trouble free operation. Heat pump Air Heaters are ideal and suitable for drying Ginger, Mushroom, Herbs, Garlic, cardamom, pepper, spices, potato chips, onions, fish, meat, sea foods, garlic, grapes, cashew nuts, confectionery, macaroni, vermicelli, noodles, etc. It is also for used for drying pharmaceuticals powder, chemical powders, granules, plastic granules, powder coating etc,. 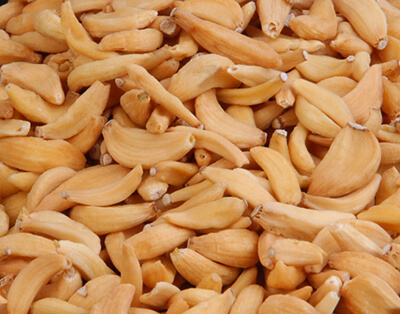 Garlic, Garlic slices are Sun drying is not recommended because it can lose flavor and color and its need to be dried at low temperatures (15 to 45˚C) for product quality optimization. This is an important consideration as they have a relatively high commercial value. Heating ambient air to use for, drying, although a simple cost-effective procedure is of limited application, particularly at higher ambient air relative humidity because of the low allowable maximum temperature conditions. Under high ambient moist air conditions, it may not even be possible to dry the material by conventional means. High temperature drying deteriorates the material structure and can render it unsuitable for further use. Low temperature drying of specialty crops reduces the risk of loss in nutrient content and damage to physical properties. Drying system incorporating a dehumidification cycle have been developed that both conserve energy and handle the material gently. The dryer operates using a heat pump where both sensible and latent heats are recovered from the exhaust air. The heat is then recycled back through the dryer by heating the air entering the dryer. The heat pump drying system is a combination of two sub-systems, a heat pump and a dryer.